This airticle is aboot the U.S. state. For the river, see Delaware River. For ither uisses, see Delaware (disambiguation). 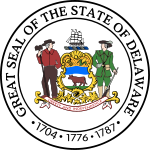 Delaware ( i/ˈdɛləwɛər/) is ane o the Mid-Atlantic states locatit in the Northeast megalopolis region o the Unitit States. [lower-alpha 1] It is bordered tae the sooth an wast bi Maryland, tae the northeast bi New Jersey, an tae the north bi Pennsylvanie. The state taks its name frae Thomas West, 3rd Baron De La Warr, an Inglis nobleman anVirginie's first colonial govrenor, efter whom what is nou cried Cape Henlopen wis oreeginally named. Delaware is in the northeastren portion o the Delmarva Peninsula an is the seicont smawest, the saxth least populous, but the saxt maist densely populatit o the 50 Unitit States. Delaware is dividit intae three coonties, the lawest nummer o coonties o ony state. Frae north tae sooth, the three counties are New Castle, Kent, an Sussex. While the soothren twa coonties hae historically been predominantly agricultural, New Castle Coonty haes been mair industrialisit. Afore its coastline wis splorit bi Europeans in the 16t century, Delaware wis inhabitit bi several groups o Native Americans, includin the Lenape in the north an Nanticoke in the sooth. It wis initially colonisit bi Dutch traders at Zwaanendael, near the present toun o Lewes, in 1631. 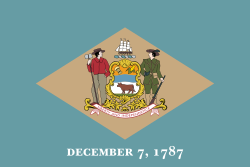 Delaware wis ane o the 13 colonies pairticipatin in the American Revolution an on 7 Dizember 1787, became the first state tae ratifee the Constitution o the Unitit States, tharebi becomin kent as The First State. ↑ While the U.S. Census Bureau designates Delaware as ane o the South Atlantic States, it is uisually groupit wi the Mid-Atlantic States an/or the Northeastren Unitit States. ↑ Melissa Nann Burke (January 5, 2015). "Delaware a Small Wonder no more?". Delaware Online. Retrieved March 10, 2015. ↑ The State of Delaware. "State of Delaware". delaware.gov. Retrieved September 27, 2015. ↑ "Table 1. Annual Estimates of the Population for the United States, Regions, States, and Puerto Rico: April 1, 2010 to July 1, 2016". 2015 Population Estimates. United States Census Bureau, Population Division. December 20, 2016. Archived frae the oreeginal (CSV) on December 23, 2015. Retrieved December 20, 2016. ↑ Schenck, William S. "Highest Point in Delaware". Delaware Geological Survey. Retrieved July 23, 2008. ↑ Molly Murray (January 6, 2015). "Delaware's new tourism brand: Endless Discoveries". Delaware Online. Retrieved March 10, 2015. ↑ "Delaware". Online Etymology Dictionary. Retrieved February 24, 2007. ↑ Johnson, Amandus (1911). The Swedish Settlements on the Delaware: Their History and Relation to the Indians, Dutch and English, 1638-1664 : with an Account of the South, the New Sweden, and the American Companies, and the Efforts of Sweden to Regain the Colony, Volume 1. University of Pennsylvania. p. 167. ↑ Myers, Albert Cook (1912). Narratives of Early Pennsylvania, West New Jersey and Delaware, 1630-1707, Volume 13. C. Scribner's Sons. p. 8.